When legendary Hawaiian surfer and Olympic-medal-winning swimmer Duke Kahanamoku visited Australia during the summer of 1914/15 he caused a sensation. 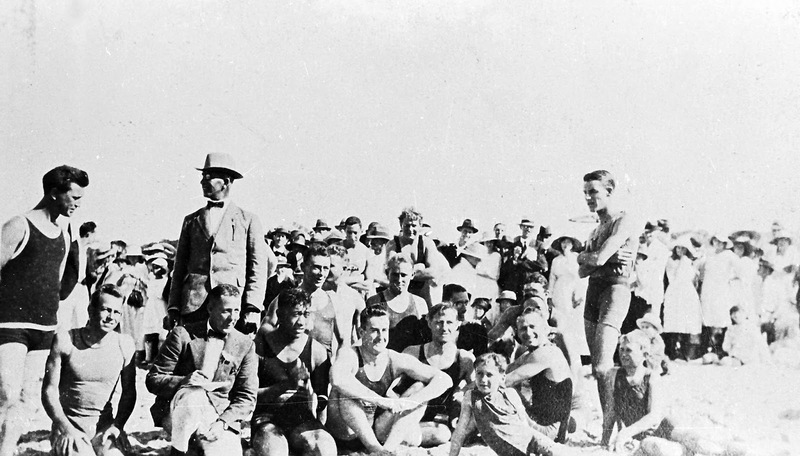 After breaking his own 100 yard swimming world record before a crowd of 6000 at the Domain Baths in Sydney, and putting on thrilling displays of surfing at Dee Why beach on a board ‘as big as the bottom of a boat’, it was the Sutherland Shire’s turn to play host to the superstar. 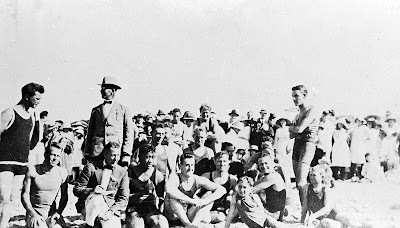 After lunch a launch took Duke Kahanamoku and the others up the river to Cronulla where the beach was decorated with bunting and packed with people. Unfortunately (as the St. George Call newspaper described it) ‘Jupiter Pluvius and Father Neptune were in a bad mood and spoilt the afternoon.’ In other words, it was raining and there wasn’t much surf! Never-the-less an impromptu alarm reel race was quickly staged between Kahanamoku, Cunha and Hay with the Cronulla clubmen acting as linesmen. There was much speculation over who would win as Hay was one of the fastest beltsmen in the State and the two Hawaiians had never competed in such a race before. Cunha, who swam a ‘crawl stroke’, struggled to get used to swimming with the belt and line and apparently nearly wrenched his toes off when he caught them on the line. But Duke was a natural and Hay lost by a yard to the Olympic champion and his famous ‘Kahanamoku Kick’. The day ended with tea at Cronulla’s new pavilion followed by music at the Surf Lifesaving Club captain’s house where the guests of honour entertained their hosts with Hawaiian songs accompanied by Duke Kahanamoku strumming on his ukulele.